Larson Electronics LLC, a leading industrial lighting company, announced the release of a new 85' trailer mounted hydraulic LED Megatower to be added to its expanding catalog of products this week. This 7-stage mobile light plant provides operators with a way to deploy over 1,200,000 lumens of intense white light anywhere a full power lighting system is needed. This trailer mounted LED Megatower is not only built extremely tough, but also provides users with over 1,200,000 lumens of intense light. You just can't beat that. This 85' trailer mounted fold over LED light plant (LM-HA-85-TLR-16X500LTL-LED) features IP67 rated construction, and operates on voltages of 120-277V AC (universal). This light mast features twenty 500-watt LED lights for a combined total of 1,200,00 lumens of intense white light. 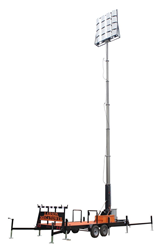 This LED light tower includes a hydraulic telescoping light mast that can elevate each of the twenty LED light heads to heights of above 85', reaching a total of 94' from ground to the top of the light head assembly. The entire assembly is mounted onto a 28' by 8' tandem axle trailer that allows operators to transport the fold over boom from location to location. The LED light heads on this light tower are each grouped into banks of four. Each bank is then wired into the NEMA 3R breaker control box at the base of the mast. Operators control the light heads via the on/off switched breaker connected to each of the banks. A push button switch is used to operate the hydraulic ram, which allows operators to raise the mast to its complete upright position. Vertical deployment is accomplished by a second push button switch that allows operators to extend the mast to it's full height or retract it back to its collapsed height. The entire light tower assembly is mounted onto a four wheel, tandem axle trailer constructed of 8" box steel equipped with torsion axles. A single 7,000 lb rated tongue jack provides a stable connect/disconnect platform as well as additional stability during tower deployment. "I would say that the chances of you finding another light tower with this much power and light coverage are slim to none," said Rob Bresnahan, CEO of Larson Electronics LLC. "This trailer mounted LED Megatower is not only built extremely tough, but also provides users with over 1,200,000 lumens of intense light. You just can't beat that."